There are options beyond simply taking medication and praying for a cure. At Invigorate Physical Therapy and Wellness, Dr. Sarah King, PT, DPT provides information, effective tools and strategies, community and support to help people diagnosed with Parkinson’s Disease move better, feel more energized, and take control of their future with Parkinson’s. We’ll walk alongside you on your Parkinson’s journey, helping you create a personalized Parkinson’s Plan of Attack designed to improve your symptoms, restore balance and movement, boost your confidence, and help slow the progression and impact of the disease. 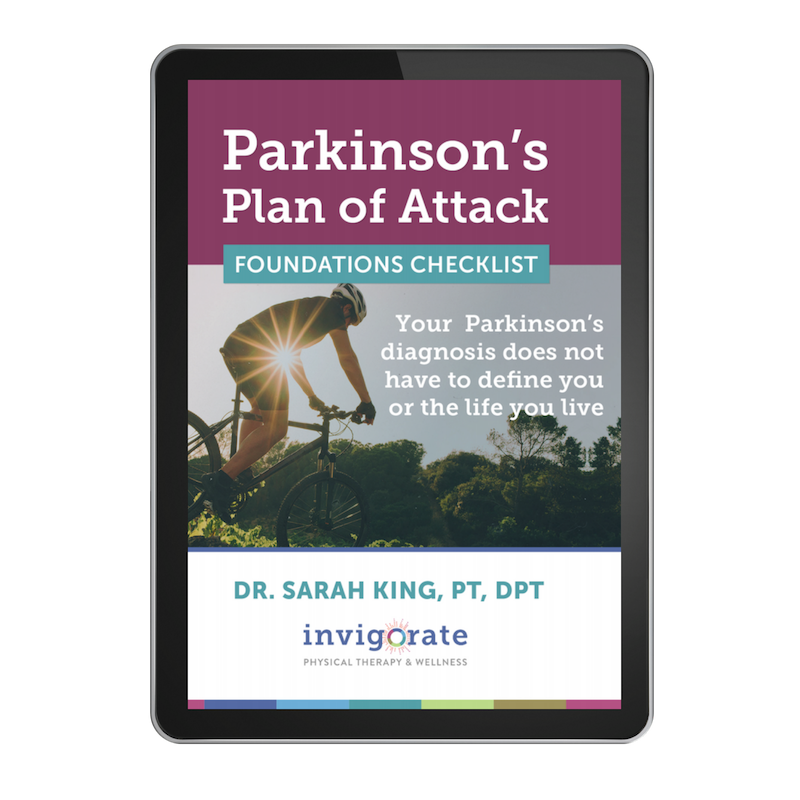 Take yours by downloading Sarah’s free Parkinson’s Plan of Attack Checklist that will outline the 3 critical components research suggests every Parkinson's treatment program should include. Ready to start a regular exercise routine that specifically targets your Parkinson’s symptoms? Our 5-week online exercise program is flexible and chock full of support. Daily, quick-hitting videos pair with a powerful workbook and supportive community to help you construct your personal Parkinson's Plan of Attack©. Our online Facebook community is private and powerful, connecting you to other action-taking and inspiring people who are walking the journey alongside you. If Parkinson's is part of your journey, you're in the right place. I'm passionate about helping you translate all the research and information about Parkinson's into simple action steps so you can get back to the life you love with the people you care about the most. I’ve helped hundreds of clients at various stages of their Parkinson’s journey overcome the overwhelm and anxiety that a Parkinson’s diagnosis can cause, and put them back into the driver’s seat of their life.